I am a hypocrite. While I hope it may be to most of you, this is not a revelation to me. However, I was unexpectedly reminded of this fact at an unlikely place this week, a meeting of my fabulous new book club. 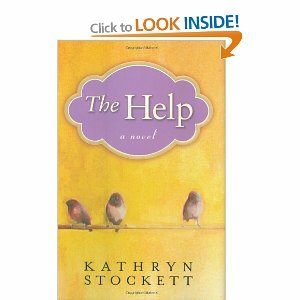 We decided last time we met that we would read Kathryn Stockett’s brilliant first novel, The Help, this month. This past Thursday evening we met to discuss the book. (Okay, more to eat, gab, and eat some more, but also to discuss.) In any case, there was universal acknowledgement that the book is fantastic and we all enjoyed it. There was also universal agreement that the heinous injustice the author describes in the book was horrifying and, given that the events described were set just fifty years ago, almost beyond belief. Until one of the women pointed out that extreme injustice still occurs in the world and that, quite frankly, each of us around the table is guilty of contributing to it. Actually, she didn’t come right out and say that, but at some point during the conversation the truth smacked me in the face. I think it was right around the time that I was polishing off my huge, dinner-sized salad, and reaching for another potato skin. I stopped, the appetizer half-way to my mouth, and looked around the table. It was loaded with food. Not an atypical amount for a group of North Americans out socializing. Pretty standard, actually. Not something I would even think about under normal circumstances. Which might just be the problem. Here we were, thoroughly enjoying the various dishes covering the table, most of which were being consumed out of pure enjoyment rather than any real need for sustenance. In between bites, we were bitterly decrying the unequal distribution of rights, privileges, and wealth in 1960’s Mississipi, when the irony hit me. We are pretty close to being just as comfortable with the unequal distribution of rights, privileges and wealth that exists in the world today as the white citizens of Jackson, Mississippi were fifty years ago. The realization promptly made me set down the loaded potato skin, my appetite suddenly gone. The problem is huge, overwhelmingly huge, and deeply, firmly entrenched. 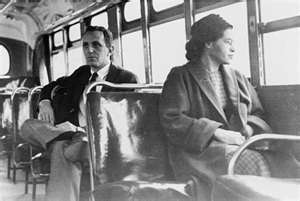 Not sure what one person can begin to do about it although, as Rosa Parks showed the world, sometimes one person can do a lot. And beginning a discussion that opens eyes, even of just a few women around a table discussing the book they have all just read, is at least a first step. Hopefully one, even a tiny one, in a direction away from hypocrisy. It certainly has given us food for thought, anyway. Which, of course, is what a truly great book always serves up. This entry was posted in Uncategorized and tagged book club, food for thought, Kathryn Stockett, Rosa Parks, The Help. Bookmark the permalink.